Well here we are, one year after facing down the Aztec “End of the World”, December 21st, 2012. A year, that happened, and turned out to be not that much different than any other, generally speaking. Last December was fraught with predictions of everything from cataclysmic annihilation to the start of a new age of emotional intelligence. Whatever your take on it was, there was really no way to avoid all the hype. But, just one short year later, we find ourselves approaching another winter solstice in the land of sea and sun along the Oaxacan coast. And yet, not a word is spoken about this unique cosmic event. The ancient cultures that once inhabited this land would never have let such an important yearly milestone pass without recognition. The winter and summer solstice and spring and fall equinox were of the utmost importance to both the Maya and Aztec people. As a matter of fact, many of their major cities were built with such an orientation as to know exactly when each of these days occurred. The Pyramids of Chichen Itza (Maya ruins) on the Yucatan peninsula are arranged in such a way that on the winter solstice a pattern of shadow and light project onto the Plumed Serpent (god Quetzalcoatl) that descends stairs of the pyramid, allowing the sun to cast light onto large head of a serpent at the base of the stairs. This marks the moment of the winter solstice. Chichen Itza is not alone in its ability to indicate the precise moment of each equinox and solstice. 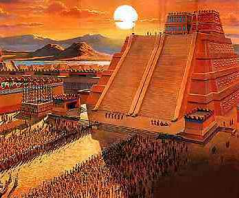 Many other Aztec and Maya cities also were built with these special days in mind. Each solstice and equinox marked a change of season, a time of planting or harvest for these ancient civilizations. Almost always, rituals meant to please their gods accompanied these events. The winter solstice, in particular, signified the returning of the sun. The Templo Mayor (an Aztec Ruin) in Mexico City pays homage to Huizilopochtli, the god of war, on its south side. Huizilopochtli was the focus of their winter solstice rituals, signifying war, hunting, the sun and also the surrounding mountains, believed to hold the rain in their bowels. During the winter solstice Aztec rituals, children were said to be sacrificed to the mountains in order to strengthen them, so they would produce rain — rain that would be needed during the coming planting season. Of course, with the advent of Christianity and the Catholic Church in countries like Mexico, the natives were forced to adopt the birth of Christ as the major significant event at the time of the winter solstice. Many cultures simply found ways to blend their ancient beliefs with the new religion. Both Maya and Aztec people saw Jesus Christ as an echo of their own gods. They simply synchronized the image of Christ into their gods of Maize or the Sun, who both represented a similar archetype. Both are often depicted as entering the underworld, dying and being resurrected, just as the sun dies each day, only to be born again with the sunrise. Seemingly ‘dead’ maize is planted in the ground during the spring, but springs to life again in the summer. Both are also considered the savior of the people, who could not live without their life giving qualities. So, as you celebrate around the time of the winter solstice this year, whether you mark the occasion with a menorah, a Christmas tree, or your own special brand of pagan ritual, don’t forget that our ways are new ways. The significance of the return of the sun has been creating new life long before we came and will continue long after we are gone, despite what the Aztec calendar may have foretold.